The Federation’s Jasmine Patterson opened the scoring from a field goal in the 19th minute before team-mate Georgia Harris made it two just after the half-hour. Gwynedd Mercy got back into the match shortly after, however, thanks to an own goal. But the Fed’s two-goal lead was restored by Emma Simmons in the 44th minute. Gwynedd Mercy’s Katie O’Neill scored a field goal in the 58th minute, while the Federation’s Jessica McClure made the game safe with a strike in the 60th minute. Ravens’ Isabella Boonstra opened the scoring with a field goal after just two minutes. 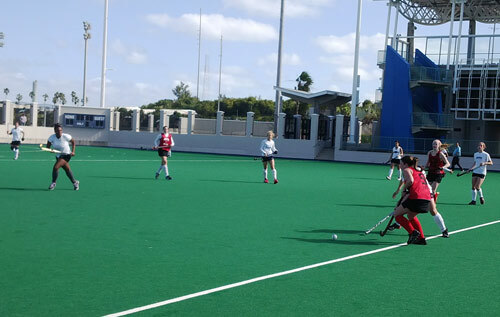 However, it was cancelled out six minutes later by Wildcats’ Maria Pichery, who scored her first goal after a reverse-stick pass from Gemma Godfrey from the half way line. Pichery scored her second from a great pass by Ashley Steede — again from the halfway line. 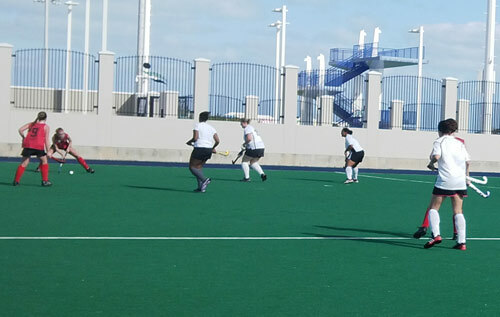 Ravens’ Megan Troake converted a penalty corner in the 32nd minute to level things up before Carolyn Soares and two from Georgia Harris saw Ravens streak away in the second half. Longtails claimed first blood from a penalty corner by injector Selina Whitter to Tiana Correia, who controlled the ball from outside the ‘D’ and fired her shot past the Swallows’ keeper. But just three minutes later Swallows’ Saki Perinchief scored a field goal after the breakdown of play in the Longtails’ circle. A penalty corner was then awarded to Swallows due to obstruction in the circle. Injector Liz Stewart found Jennifer Hale at the top of the ‘D’ and she beat the Longtails’ defenders all ends up by slamming the ball past the keeper in the 15th minute to take a 2-1 lead. Another penalty corner was awarded to Swallows but this time there was no conversion. Despite this, Liz Stewart collected the ball from this broken down penalty corner on the left, dribbled infield. After a bit of a scrimmage near the Longtails’ keeper, Stewart found Hale, who converted to extend their lead to 3-1. Stewart would then score a field goal from a dribble from the 25-metre line into the circle and a shot at goal in the 49th minute. Team-mate Sara Perdichizzi added another before Stewart bagged her second after a dribble from the 25-metre line into the circle to make the final score 6-1. Budgies’ Kaitlyn Miller scored field goals in the 12th, 47th and 52nd minute, while Jasmine Patterson notched two in the 18th and 35th as Canaries were routed.